Sophie Gutermann von Gutershofen was born in Kaufbeuren, Bavaria, the oldest child of a doctor and his wife. She received a strict religious upbringing in the Pietist faith, supervised by her father. However, her education also included subjects unusual for girls of that era, such as history and astronomy. In 1753, she married Georg von La Roche, the adopted son of a nobleman, with whom she had eight children. With this aristocratic marriage, Sophie von La Roche entered high society, and her intellectual and literary abilities flourished. She had access to a huge library at her father-in-law's castle of Schloss Warthausen, near Biberach. She became the hostess of an elegant salon in her home at Ehrenbreitstein, near Coblenz, mentioned by Goethe, that was frequented by prominent 18th-century authors and intellectuals, and carried on a correspondence with many. She published a wide variety of works beginning in 1771, including novels, travelogues, moral stories, and articles. 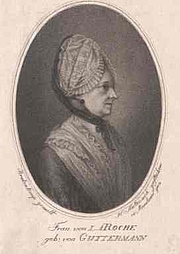 She edited and published the periodical Pomona: Für Teutschlands Töchter (Pomona: For Germany's Daughters), in 1783-1784. After her husband's death, she traveled independently -- one of the first German women to do so -- to Switzerland, France, Holland and England. Through her daughter Maximiliane, who married businessman and diplomat Peter Anton Brentano, Sophia von La Roche was the grandmother of writers Bettina von Arnim and Clemens Brentano. Sophie von La Roche is currently considered a "single author." If one or more works are by a distinct, homonymous authors, go ahead and split the author. Sophie von La Roche is composed of 4 names. You can examine and separate out names.